Sock Sail Mast | Canadian SeaSpray Assn. 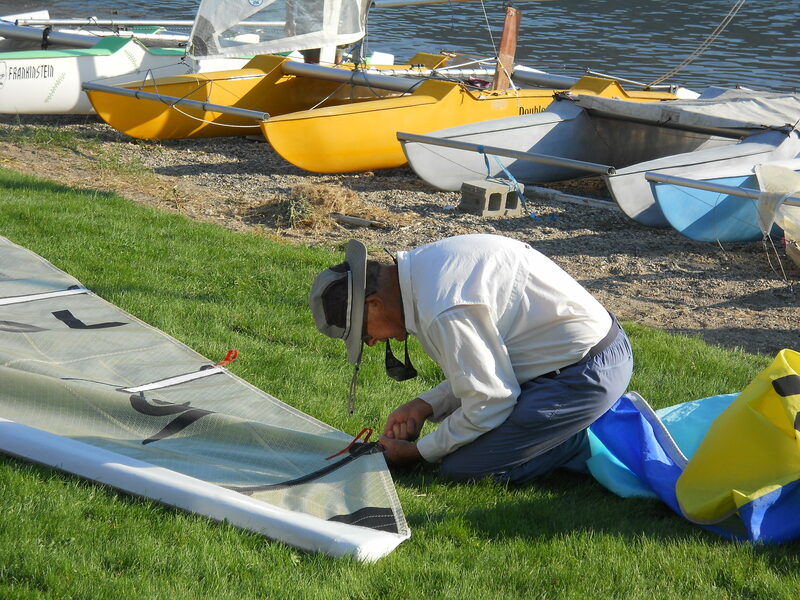 Stan Storwick, adjusting the top batten on his sock sail prior to raising it. At one time this type of sail was the only one available. The sail is slid onto the mast while it is off the boat and then raised as one unit. This is the same setup used on the Laser 1 but on the SeaSpray, additional rigging (stays) hold the mast up. The sock sail rig has the advantage of sails that are purpose built to reduce turbulence at the mast. Some adjustments to your project will probably be necessary and innovation is, of course, acceptable. The mast is a 3″ irrigation pipe with a wall thickness in the 0.05 to 0.07 inch thickness approximate. Check the class rules for acceptable dimensions. The mast cap must be fabricated to match the profile of the sail, and an upper batten holder is needed to induce bend – again is fabricated to match the sail. It is made of two aluminum pieces shaped to fit with spacers between for easy insertion of the top batten tip.